Nintendo Switch Zelda and Mario Themed Controllers | Nerd Much? I don't know anyone playing 1-2 Switch religiously, so not much of a loss there. 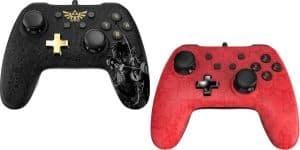 To be perfectly clear, though these might look like the pro-controllers for the Nintendo Switch, they lack a few distinct features. Both of these do not have the HD Rumble, gyro controls, or an NFC reader for Amiibo support. The latter seems fine for those that don’t collect Amiibo, or have already downloaded the appropriate bonus content and don’t need the support anymore. The lack of HD Rumble seems an odd choice, with almost all controllers possessing the feature these days. But it is reflected in the price. I don’t think you’ll ever get an officially licensed controller that isn’t the same price or more than from the actual console company. This lack of key features does not matter much for playing most games on the Switch so far, like Breath of the Wild. Though I wouldn’t be too sure that Super Mario Odyssey won’t have some kind gameplay gimmick that uses one of those features. Even if they are bundled together in the “frequently bought together” section. That doesn’t mean any kind of deal or discount, so keep that in mind. As to games that do use the rumble and gyro for sure I can only think of one; I don’t know anyone playing 1-2 Switch religiously, so not much of a loss there. That said, the lack of features is reflected in the price. They are about $30 USD each, compared to the price of the pro-controller which is currently sitting at about $60 USD. They are officially licensed by Nintendo, and come with a 10 foot USB cable. Good for actually reaching across the living room while you’re playing. Both controllers feature rubber grips on the back and “six interchangeable analog caps for custom control.” You can pre-order them now and they will be released October 23, 2017. Both are featured on Amazon and shipped by Amazon.